There is nothing better than relaxing in a beach chair by the ocean with a great book in your hand. I always have my nose in a book—if the kids are behaving! 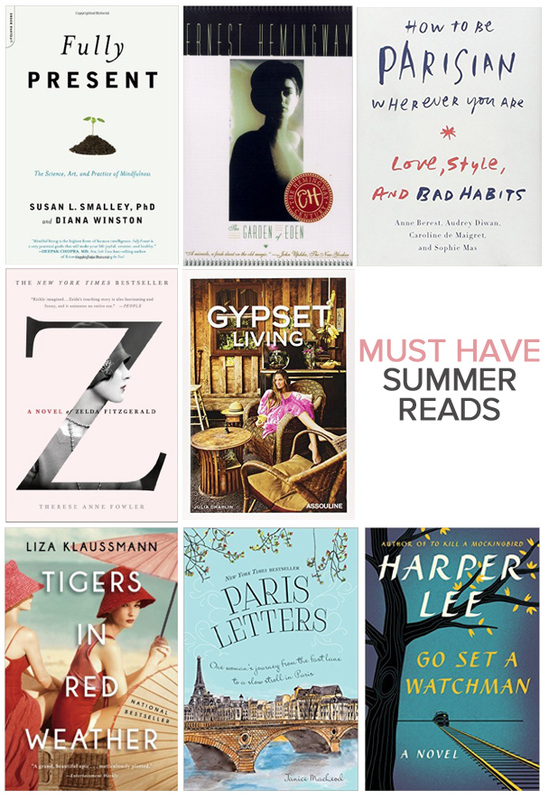 I narrowed down my favorite summer reads and even a few I haven’t gotten to yet but can’t wait to drive into. Fully Present: The Science, Art, and Practice of Mindfullness: I am in the middle of this book right now and I just cannot put it down. It is a beautiful melding of the science and art of mindfulness. The Garden of Eden: This is maybe one of my favorite books of all time. A summer romance and lots of scandal on the coasts of France and Spain. How to be Parisian Wherever You are: I literally read this in one day! It’s a quick, fun and funny read about all the essentials for being a Parisian. Z. A Novel of Zelda Fitzgerald: The lovely woman at the bookstore the next town over recommended this, and it’s going to be my next beach read! Gypsy Living: I LOVE this book. Stories of modern day gypsies and their beautiful dwellings. Tigers in the Red Weather: The PERFECT summer read about long sunny days spent on Martha’s Vineyard. Lots of family drama! Paris Letters: Ever thought you should just pack up your life and move to Paris one day? OK, well this girl did and it’s a great—and true—story. Go Set a Watchman: I cannot tell you how excited I am for this to be released. I pre-ordered it months ago and will jump for joy when it arrives. It is the first book Harper Lee ever wrote, only to have it rejected by publishers. She re-wrote it into what we know today as To Kill a Mockingbird.